I was at a High School baseball game last night, and as I was looking around at the crowd, I noticed how many people were fat. Not just “beefy” or “heavy”, but plain ol’ fat! I have just returned from Africa where the people are desperately hungry to see the power of God working in their church – so much so that they will walk for 8 hours, sleep on the floor of the church, and be content with rice and beans just so they can hear the Word of God preached under the anointing of the Holy Ghost. Americans are not that hungry, neither are they willing to pay that kind of price for anything. As a result, in Africa, souls are getting saved, getting supernaturally healed, and getting ignited with the Fire of God. Churches there are being transformed from sleepy little country churches to on-fire Spirit-ignited soulwinners. 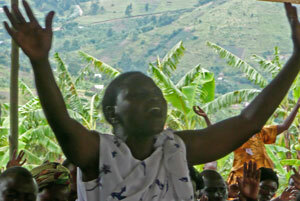 Revival is beginning to break out in Africa … but not in America. I’d like to say something about the miracles. There has been a lot of incredible miracles, especially on this trip. They have ranged from the blind and deaf to issues of blood and paralysis. There have also been a few that are a little too weird to relate here. But the focus of all my campaigns out here is not about miracles – it’s about revival. Miracles are wonderful and are like God’s seal of approval on your ministry, but miracles do not convert the soul, change your heart, or save your soul. Only the Word of God can do that. I remember when I went to Nigeria and the Lord spoke to me and said, “No miracles. If you do the miracles, they will not hear the message.” Just like that. Right out of the clear blue air. In spite of that, God still did two miracles, but I got the message. I believe that this is the real problem with these huge international healing ministries. They got focused on the wrong thing, enamored with the blessings, and forgot the purpose for which they were called – to preach the Gospel and win souls – and have ended up making a circus of a very holy gift from God. Instead of leading the Body of Christ to the altar so that God can move in our lives and in our churches, they instead are leading us in another direction, away from the altar and toward a focus on self – what blessings God will give us, what is in it for ourselves, what problems that we want God to fix … gimme, gimme, gimme. I call it the Gospel of Me. But no revival comes without deep, broken-hearted repentance at the altar. So instead of bringing health to the Church, they are leading them into folly like a Pied Piper playing an alluring but dangerous melody. Nevertheless, it is certainly gratifying to see real, honest-to-goodness miracles happen right in front of your eyes. I may be excited about it, but you should see the look on the face of someone who has really been healed of some disease, or pain, or crippling infirmity when it is gone, completely gone, eliminated, whoosh! Then there are the people who, when you touch them, you can feel the anointing flow. I can’t explain it, but you know that something special just happened to that person. Some of them shake, some swoon, some sway back and forth, and some just melt, but all of them are irrevocably affected. You know God has done something to them that goes deeper than the flesh and into the issues of the heart. They have, on some deeper spiritual level, been changed. On this trip I have seen the blind see, the deaf hear, the crippled walk, and a myriad of other diseases and infirmities healed, but I think these spiritual anointings, while very mysterious, are the greater miracles. These things don’t happen naturally, not even here in Africa, and when the oil starts flowing in the service, you can feel the Anointing in the air … and that is even more exciting. Perhaps there is something here that is related to the finger of God preparing hearts to receive this coming revival. Who knows? Certainly not me. I just show up and am watch as God deals supernaturally with His people. But I sure am glad to be here to see it. Amen, that puts a real point on things out here. We are way off the main road on a mountaintop overlooking the Queen Elizabeth National Park. We are holding our revival services in a church right on top of this mountain. The road up here to this church is narrow, winding, and full of ruts and holes. Lord help us if it rains! You got to wonder where the people are going to come from (actually, I wonder this almost every time), but so many people have come ( between 200 to 300) that they have to stretch a huge canvas supported by poles outside the church to accommodate everyone. This is a long hard walk up a steep mountain for these people to get here, but I don’t think any of them care. They just want to hear the Word of God. When you look out over the crowd, that’s when the Scripture from the Beatitudes really hits you – these people don’t have all the scintillating distractions we have in America, so their souls are open to the Kingdom of Heaven. What a very different thing we have here! The first couple of services in these meetings are always hard. I have to snap their illusions and bring them to a realization that “church as usual” is not good enough. No matter how good they think their church is, if souls are not coming to the altar in any real numbers, they just simply do not have a revival – they just have church. This is not hard to do here in Africa – they already know this. That’s why they are here. The hard question is not whether they are satisfied, but whether they are willing to pay the high price to bring revival. My core Scripture is always Genesis 30:1, “Give me souls, lest I die!” You gotta want it so bad that you are willing to die, to give your life to see souls get saved. Anything less and you will not be willing to do what it takes to have a real revival. They don’t care. They were willing to walk up the side of a mountain to get here and they are willing to do whatever it takes to have a revival. It’s like they are right in the palm of my hand, sitting on the edge of their seats, taking in everything I tell them. Just tell them more … and please don’t stop talking. Lord, where have You been hiding these people? Some wrinkled old woman has pushed her way through the crowd and kneels down in front of me while I am sitting on the side. She is jabbering away like crazy and pushes a 1,000 shilling note in my hand. That’s about 40 cents, but you can bet that’s a lot of money to her. She keeps pointing at her arms and her veins – something about her blood or something – and then just up and hugs me in a bear hug. Apparently, this 80+ year old woman had been very, very sick for a long time and she felt that the Lord had told her that if she would just come, He would heal her. She came in while I was praying and, sure enough, got healed. I’ll tell you what – this was one excited old woman! This church is pastured by Noah’s sister and her husband. This woman can sing. I mean like, really sing. During the song, “Jesus, Be Thou Glorified”, she touched places in my heart that have not been touched in 40 years. I was floating way out there somewhere in the Spirit … and didn’t want to come back down. This family is royalty. That’s the impression the Lord gave me about them today. The father and mother were having revivals in Uganda when Idi Amin threw them both in jail, leaving 9 little kids to fend for themselves. An oppressive culture of fear swept over the land and few would do anything to help. The father, Elijah, thought he’d never see his children or his wife again. The oldest, just a young teen-ager, was taken and thrown in jail, and the 2nd oldest thought he would be next, so at 10 yrs old, he left for the streets of the city where he became a street kid for years. The younger kids were scattered because the government took their home. They were finally delivered, but what a price to pay. They never forsook their faith in the face of imprisonment, torture, and the destruction of their family. God spoke to the father and told him not to despair, that all his children would be preaching the Gospel, and he would see revival come with his own two eyes. And it has happened just like God told him – all his children are in ministry. And then here I come along with this hard-hitting message of revival accompanied with this special anointing that comes down on every service we’ve had like he hasn’t felt since the 70’s, and you can just imagine how excited he and his wife are. These people have paid a price that I can’t even hold a candle to. I look at them and I see a family that is royalty in God. God has made his children princes and princesses. My guess is that there’s a lot of this here in Uganda. I reckon we will be surprised to see who is really who when we get on the other side. We have been in a makeshift tent for a church – more like a huge tarp on sticks. We had 2 and 3 services a day and an open air crusade in the evening. The Lord would give me brand new messages every time. It was really neat how they would develop right out of the air, and how they would be right on target. Throughout the message, these people would be cheering and praising the Lord, arms waving, and faces beaming. You can feel it working. God is planting the seeds of revival here. These people will go back to their churches with a fire in their hearts and spread it to others. I believe that. I really do. You can see in their faces that they have been changed and their entire outlook has been converted. They are fired up to take the focus off themselves and turn it squarely on winning the lost. What better thing could you hope for? God has accompanied His message with healings also. At least two or three people were crippled and got healed – I mean like throw away the crutches because they can now walk type of healed. One guy came up that was paralyzed on one side, arm and leg, and started hollering at me. At first, I couldn’t figure out what he wanted. He didn’t want anything! He was trying to tell me that God healed him and he was no longer paralyzed! There was a host of others, but we didn’t call for testimonies so I’m not sure what some of them were, but the thing that really gets me is that they weren’t healed in a healing line with someone anointing them with oil and praying over them. They were healed during the services just by the presence of the Holy Spirit. Yeah. It was that good! This seems to be increasing every trip I take. It’s as if there is a crescendo building with God’s people and He is rising up within them like a burgeoning ground swell of desperation, faith, and hope for revival. The services are becoming more powerful and the miracles are becoming greater and more plentiful. Maybe it’s just my imagination, but I think God is about ready to break out of the box. I’d like to tell you all about what Africa is like and give you a tour guide of what it is like here, but honestly, all I pay attention to is the services … and Cindy. I guess I’ve been coming for so long that I don’t even notice things any more. Or maybe it’s just that the excitement about an impending revival here outshines everything else. Well I heard the bishop preach today, and boy, can he preach! We finished the day at a funeral where hundreds of people had gathered out in an open field. Funerals in East Africa are always huge affairs. The main focus of the funeral is always on the preacher, and Bishop Girado did not disappoint. And then, at the end, he divided the crowd in quarters and prayed each section through a Sinners Prayer. And wow, did they pray. At the top of their lungs. It was great. Yesterday we finished up in Kumi. What a great service we had! (In contrast to the day before.) I could feel the river flowing right in the beginning and it just grew from there. You could feel it coming, and then it hit and picked you up in the flow and carried you away. How do you describe something like that? I listen to some people talk about how good a service was based on what the message was about, but here we’re experiencing a flow of the Holy Ghost that lifts you up and carries you higher in the Spirit. Your heart just lifts and flows in the Spirit. It has nothing to do with the words that are said, but it has everything to do with the presence of the Spirit of God. But people from dead churches never seem to understand. We had a string of testimonies about the healing line yesterday. You should see how excited these people are. Well yeah, duh. They have felt the power of God heal them – some of them from sickness and pain that they have had for a long while – and they are so thankful to God for His mercy. It really grabs your heart to listen to them. These are simple people in deep poverty, afflicted by all sorts of things, but it is that same simplicity that gives rise to a faith without obstructions, restrictions, and complications. They just believe. They don’t understand anything else. And so they expect to be healed. I’m done with this part of the trip. A lot of souls got saved during these 3 weeks and a lot of souls got healed. That’s pretty exciting seeing that’s not what I came here to do. I came to ignite churches and start the fires of revival burning. But wherever the Spirit of God is moving, desperate souls will come. I’m heading for Kampala tomorrow to pick up Cindy and Barry. We will be heading south and west with Pastor Noah for a whole string of services and a whole new set of adventures. I can’t wait for them to see these things with their own eyes. Then they can tell you instead of me! Sorry this has been delayed. We were way out where there was no network available. We’re back now and wait til you hear the incredible stories we have to tell! Well Day 3 in Kumi was incredible, but Day 4 was flat. Oh, I guess the message was good and all that, but the fire and power just seemed to be missing. Maybe it was just me. I’m sure if you asked the people, they would tell you how great services was, but it sure wasn’t like yesterday … at least to me anyway. I struggled all the way to the hotel and into the night. Did I do something wrong? Maybe I got a little too cocky from yesterdays services and just expected the power to be right there at my fingertips. After so many years of this stuff, you’d think by now that I would have it down pat, but there is never a service that I go into that I am not nervous. I am constantly aware of how inadequate I am. Oh God, please send down the power! And He always does – just some days more than others. But there is always a message – always. And it is always the right one. I think maybe I get so tense because so much is riding on it. I remember being told that mistakes in this business, unlike any other business, are fatal. Amen. We will make mistakes, but I don’t want to minimize them by just assuming that God will cover them in the Blood just because. I’ve been reading those books from Leonard Ravenhill that I’m giving to Pastor Noah, and he really drives hard about prevailing prayer and intercessory prayer. It sure would be nice if I had some intercessory prayer warriors behind me – you know, the kind who travail in prayer through the night in agonizing battle and tear down strongholds. Yeah, we need some more of them. As I was reading I realized that I don’t even know anyone who is an intercessory prayer warrior, not even one! Maybe they’re just there in secret like Elijah’s 7,000. I sure hope so because I could really use them to hold me up sometimes. Anyway, today was much better. Yesterday the pastors wanted to be anointed with oil and prayed over. Today the people in the congregation came up. This is serious, covenant-making, dedication-type prayer. They know they are taking a step that they cannot ever go back on, but they are serious about this and want it sealed with the anointing. You gotta love these people! And then, here comes the healing line … Some folks have come here from the last place, the church out in the bush and told them about the healings we had there. These folks want the same to happen here. It doesn’t seem that I have much of a choice in the matter, so we launched into it. You go through a lot of tidal forces out here pulling you one way and then another. I guess that’s just the nature of the beast. It will be good to have Cindy out here with me. Never let it be said that serving the Lord is not a great adventure. It is also a battle. And that, I guess, is part of the adventure! Just about every day, the devil hits us with something new. Usually it’s the vehicle (which is what it is today), but Satan’s imagination is not limited to that. It’s always something. He can’t stop us, but he can sure vex and frustrate us. But the trick, I have learned, is to turn his attacks around on himself. So while I am stuck here at the hotel for 5 hours instead of being at the church preaching, I have decided to use this time that the devil has given me to storm the gates of Heaven for revival – right here, and right now! Revivals do not come without travailing intercessory groaning and desperate battles of prayer. I may not be an intercessor, but I do know that preaching without prayer is like the Meat Offering in Numbers 28 without that pure, beaten oil to anoint it – dry, tasteless, and ineffective. Perhaps, I should thank Satan for this time to cry out to God. … ummm …. perhaps not. Yesterday, the anointing filled the church so heavily that the bishop could actually see the glow. He was so excited – I mean like jumping-up-and-down excited — that I called home and had him tell Cindy about it. I didn’t see it cause I was busy giving the message, but I could sure feel it. It was the presence of the Shekinah Glory. Souls got saved, pastors came up with broken hearts to be anointed and prayed for, and the congregation felt the Holy Ghost conviction to repent. We broke through and something great happened. The verse that kept resonating throughout the whole service was “the Lord is strong who executeth His Word”. Amen. Don’t make the mistake of not believing God. He is strong! And He WILL execute His Word because it is HIS Word. Praise God, revival is coming, yea, it is even here already! And this was just the 2nd day in Kumi. I am heading there now for the 3rd session. The van is finally fixed – this time it was the radiator, yesterday the brakes, flat tires, engine, gas, etc. But we are on our way. Just like that ol’ Gospel song, “Praise God, I’m on my way to Canaan Land”. Do I sound excited? You have no idea. You’d have to be here to understand. As they say in Texas, “it’s better felt than telt”.